This wall-mounted xylophone lets little ones explore music, color, and movement. Put your little one on the fast track to loving music with this pint-sized xylophone. 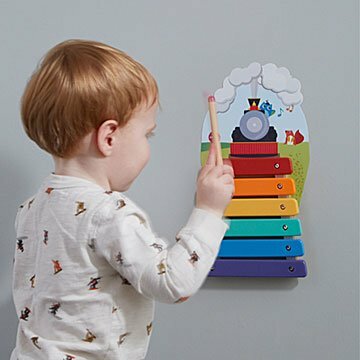 Charmingly illustrated with the musical bars becoming a rainbow railroad track, the instrument attaches to the wall with removable, reusable adhesive, so that it adds to your child's playtime repertoire without adding to clutter on the floor. Designed for children ages two and up, it helps with color familiarity and hand-eye coordination, giving your little maestro the opportunity to rock out. Made in China. Have put this up in the baby nursery. It's such a great concept, making the walls fun and interactive.